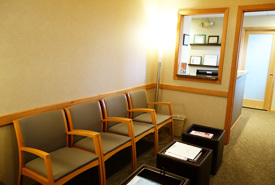 Our welcoming environment will help you feel right at home. From the moment you walk in our door we want you to feel welcomed by our cozy, friendly environment. It is our pleasure to make you feel at home and hope that we can put to rest any concerns you may have. When you first arrive our receptionist will ask for your photo ID and any insurance information you have. Next, she will ask you to complete the new patient paperwork, which will include your medical and dental history. Review your new patient forms and address any chief complaints. Perform a comprehensive oral exam checking for any cavities. Take any necessary digital X-rays. Create a customized treatment plan with the options that he feels are in your best interest. Answer any questions you have and explain every option to you in detail. If your gums are healthy you may even get your teeth cleaned at your first visit. The health of your gums and the bone that surrounds your teeth is important to us. If necessary, any therapeutic measures beyond a routine cleaning will be discussed. Please allow 60 minutes for this appointment. We value your time and pride ourselves on not making you wait. We gladly accept most major PPO dental insurances and some select HMO insurances. We offer 3rd party financing options through CareCredit and Spring Stone Financing.